I came across blabberize when I was researching projects to do as part of a Roald Dahl based summer camp. 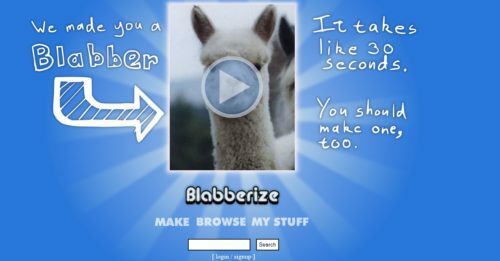 Blabberize is a website which allows users to record their voices and have the mouth of a picture move along with the words. The kids had been working on the theme of bullying during the week and they were given the task of making a blabberize ‘movie’ in which some of the characters persuaded Fleshlumpeater to quit his bullying ways. This involved writing the script, finding appropriate character images online, marking out the mouth of each picture and recording their voices. It worked really well. Kids always love recording themselves and hearing their voices back over the classroom speakers, or seeing themselves on the screen, but this was particularly nice as they could see the characters’ mouths move as they spoke. If they laughed the mouths opened wider, and this resulted in a lot of experimentation with different sounds. The students also enjoyed playing with the various shapes they could make the mouths. But it also became clear that there were some other benefits of using the website, other than it simply being fun. Firstly, there was the technology element. Students needed to browse the web to find pictures to use, which they saved onto the computer and then inserted into the website. They then had to select the area they wanted to work with by using the mouse. These are common computer skills that children need, including in desktop publishing. In addition, they needed to drag the tiny little markers around the mouth into the right place using the mouse. I was surprised how difficult one of the children found this, but it was clear that he’d improved in his ability to match the cursor to the point and drag by the end of the activity. Then, there was the recording itself. Like I say, the children loved this. All of them. So, you can just imagine how this could benefit a child who doesn’t like reading aloud to their classmates. Here is an opportunity for them to read to the computer and SEE what volume they are able to produce. If they aren’t loud enough, the mouth will barely move. They will know that they need to speak louder, and they will do it. It’s clear how this could benefit the children who seem unable to project their voices. b) using a screen recorder to capture the first ten scenes before repeating and then clipping all the recordings together. So, in summary, Blabberize – check it out.